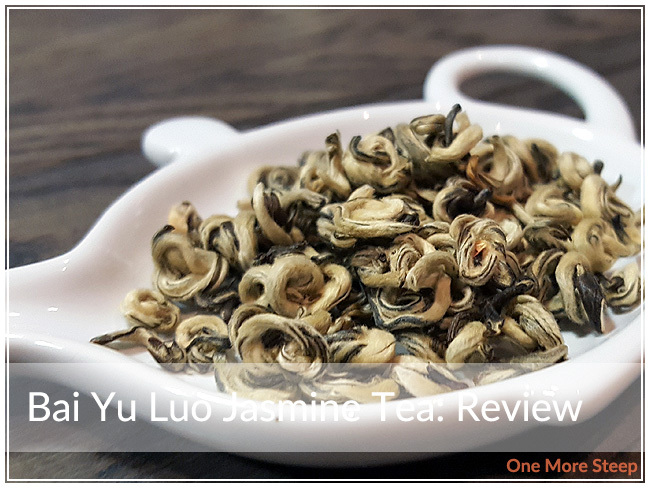 Grand Tea has provided me with Bai Yu Luo Jasmine Tea for the purposes of providing an honest review. Bai Yu Luo Jasmine Tea came to me in a gold sample packet with enough tea to have three pots of tea. 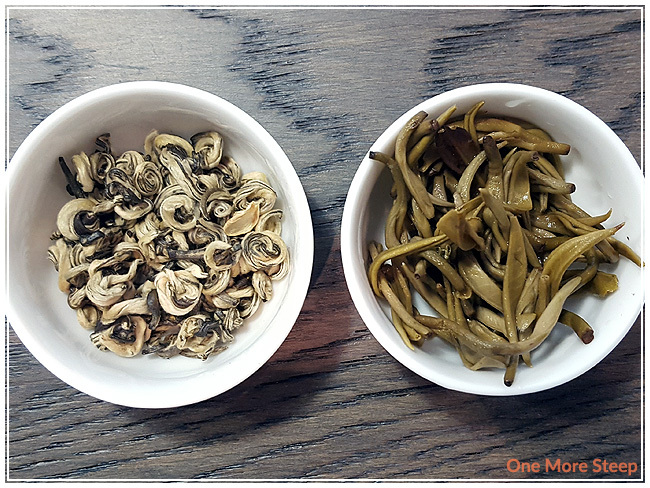 The tea leaves are beautiful with each leaf curled, with varying colours of dark olive green and a pale, cream colour. The lighter part of each leaf has visible downy feathers on it. The aroma from the dry leaf is primarily that of the jasmine – the dry tea is bright and floral. Bai Yu Luo Jasmine Tea is a Chinese green tea that has been scented with jasmine flowers and is from the Yunnan Province. I’m really quite fascinated by how the tea leaves look, since the colours have such a high contrast which makes them beautiful to look at. I couldn’t find any steeping instructions for Bai Yu Luo Jasmine Tea. My initial steep of this green tea was in 79°C (175°F) water for 90 seconds. 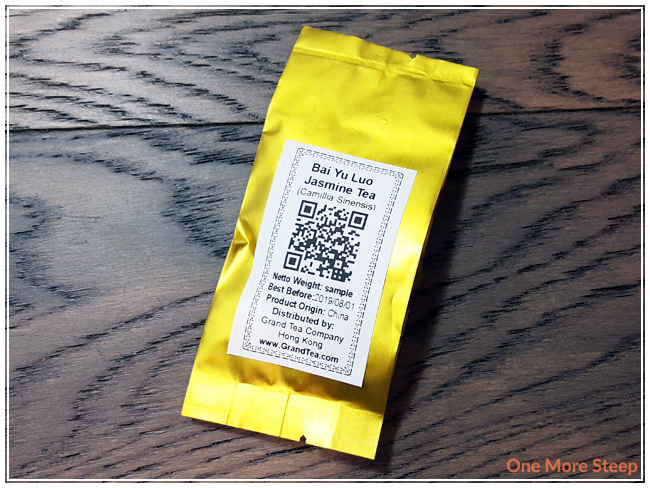 Bai Yu Luo Jasmine Tea steeps to a light yellow with a very floral aroma. It smells almost sweet with the strong jasmine fragrance. The taste of this tea carries a light sweetness, there’s the jasmine/floral notes with a slight creamy flavour to it – almost buttery. I found that the tea was smooth with zero bitterness or astringency at the temperature that I steeped it for. 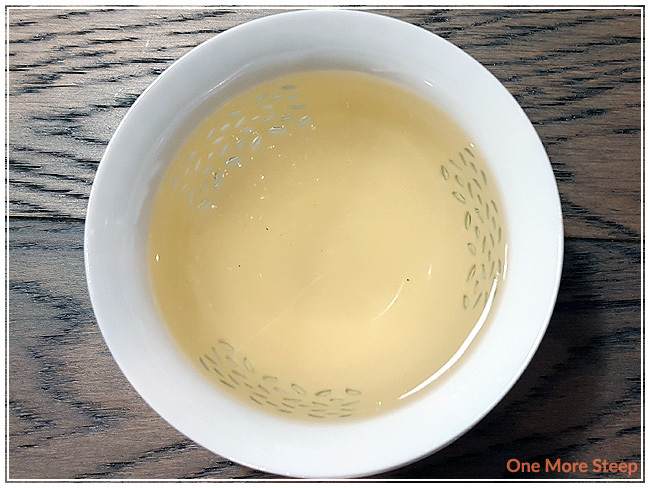 I resteeped Bai Yu Luo Jasmine Tea six times (seven steeps total with the same leaves), and I added an additional 30 seconds for each steep. I found that the flavour profile stayed fairly consistent throughout, although it did become less sweet despite the floral notes remaining strong. The flavour began to decline by the fourth resteep. I loved Grand Tea’s Bai Yu Luo Jasmine Tea. I found that this tea was both beautiful in the dry leaf and in the flavour of the steeped tea. 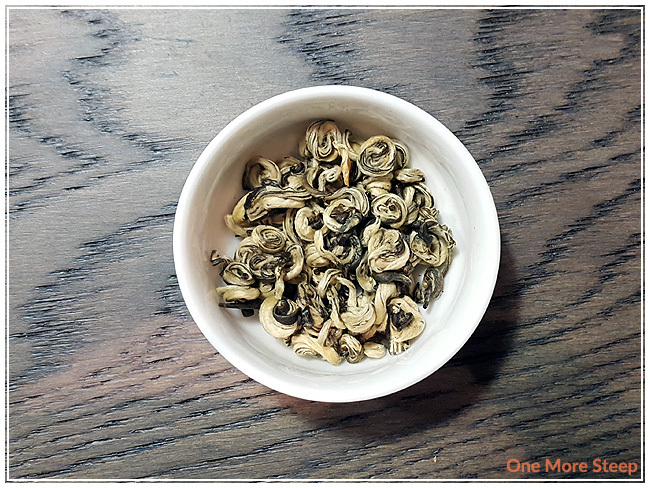 I really enjoyed the floral sweetness that I found in the initial steep, and the creaminess I found in this green tea was a pleasant surprise. I think that this tea did beautifully when resteeped and would really recommend resteeping it to get all of the flavour out of the leaves.